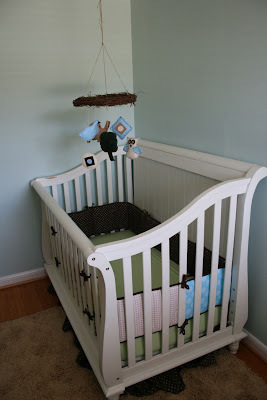 This week I have finally finished the nursery for Baby Brother. And, hey, I have almost two weeks to spare. Our freezer is full of meals for after his arrival. His diaper basket is full. Our house is spotless. Including the kitchen cabinets, which have been thoroughly scrubbed. We have a double stroller on order. All the newborn gadgets are out of the closet. We are ready, I tell ya! The rocker I found on craigslist (with new custom cushions), the guest bed, the baby comforter, and the canvases I painted for the wall. Baby Brother's bed, complete with his homemade mobile. 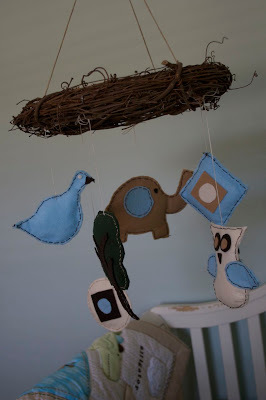 The mobile I made for him. I stole this idea from a gal in California, who is a member of what might just be the most creative family ever. A closer look at the quilt, courtesy of Target. A closer look at the canvases. My sister and sister-in-law will be proud. They are both art teachers and always have the most fabulous creative things in their homes. It has taken awhile, but I think I'm finally coming into my craftiness. Thanks for the inspiration and instruction, Sisters! Please come soon, Baby Brother! LOVE LOVE LOVE it Nicole. 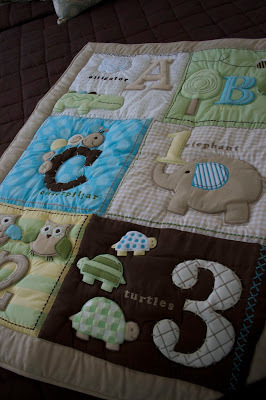 You are so crafty and creative - this little guy is going to love his new room! Thanks for sharing your journey online - I have been keeping up with you probably when you don't even know it! Praying for you these last weeks - you look fabulous by the way! Beautiful! How fun. 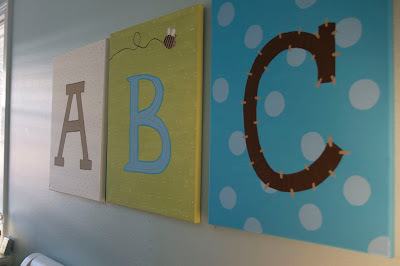 I love the canvases...so cute! 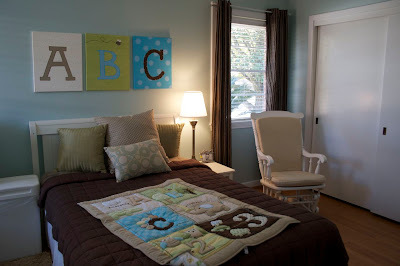 That room will have a sweet baby in it so soon! You are amazing. I think you have created such a cute room! Now, I would like to see you blog about those meals you froze. I have been trying to wrap my mind around what is and isn't okay to freeze. And, your blog inspired me to ask.